The Neptunes in concert. Don't worry, the drummer is harmless. but me and my friends get no respect! —Pain, From their song "Running Underwater"
"Jabberjaw is a great white shark with a voice like Curly from The Three Stooges. That's an odd concept, I don't care where you're from. That makes H.R. Pufnstuf look staid." In 1976, Hanna-Barbera created this show for ABC as a response to the popularity of the film Jaws. Frank Welker based the lead character's voice on Curly Howard from The Three Stooges, along with Rodney Dangerfield's Catch Phrase, "I don't get no respect." Jabberjaw, an amphibious shark, is the drummer in a rock band called the Neptunes. 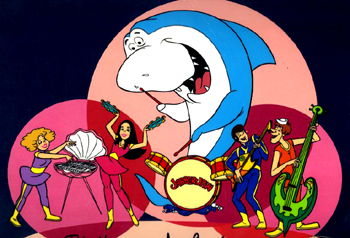 His human friends are guitarist Biff, bassist Clamhead, keyboardist Bubbles and tambourinist Shelly; the last appeared to be allergic to Jabberjaw's displays of affection. When they're not making music, Jabberjaw and his friends solve mysteries Under the Sea, in yet another variation on the Scooby Doo formula. They live in a future when the ocean floor has been extensively colonized with domed cities and the like. In subsequent seasons, Jabberjaw was a referee in Laff-A-Lympics and a competitor in Yogi's Space Race. Cartoon Network did a short music video in the nineties that ReVisioned the Neptunes as an alternative-rock band with a trumpet; the video still airs regularly as filler on the Boomerang network. Detective Animal: Jabberjaw helps Biff, Shelly, Bubbles, and Clamhead solve mysteries in a futuristic underwater world. Everything's Even Worse with Sharks: Subverted, as Jabberjaw is harmless to humans. Though not to Shelly, for different reasons. Played with by a Villain of the Week who turned his Mooks into sharks and a shark woman who tried to seduce Jabberjaw. Expy: Shelly and Bubbles resemble Alexandra and Melody, respectively. Hey, That's My Line! : Shelly once used Jabberjaw's catchphrase. Jabberjaw threatened to sue her for that. Jerkass: Shelly, although sometimes she was a Jerk with a Heart of Gold. Tailfin Walking: How Jabberjaw gets around. Totally Radical: Seriously, who in real life actually says "Wowwy-wow-wow!"?! Why Did It Have to Be Snakes? : Robotic shark ejectors! ↑ And still breathing, oddly enough. This page was last edited on 18 October 2015, at 20:17.